Hallowe'en night is almost here. I love the little kids coming to the door for their treats, especially the tiniest ones who don't have a clue what's going on. So cute! I also love immersing myself in classic horror stories, kitschy horror stories, and comical horror stories. 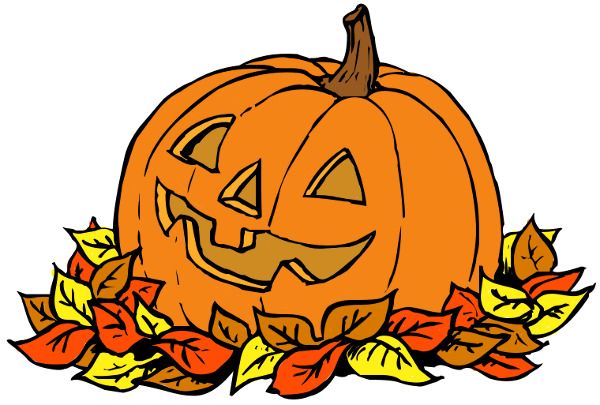 Here are some of my favourite Hallowe'en chuckles. 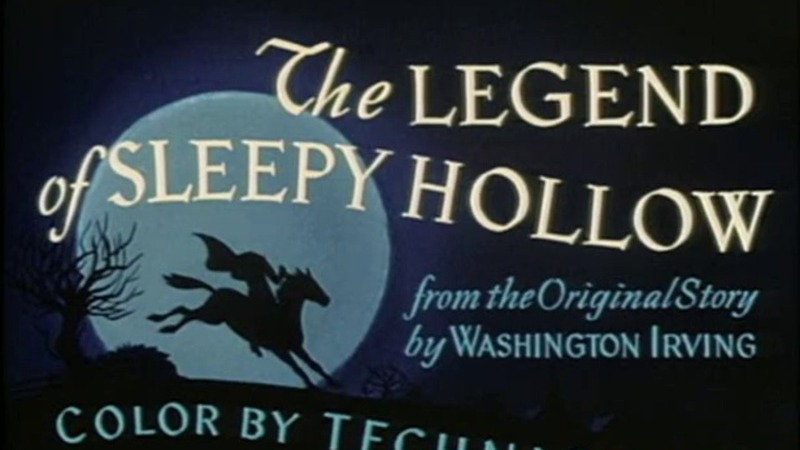 Disney's 1949 take on Washington Irving's The Legend of Sleepy Hollow is a must-watch this time of year. It is a perfect combination of cheeky humour and the genuine chills. Previous post found here. See those guys? 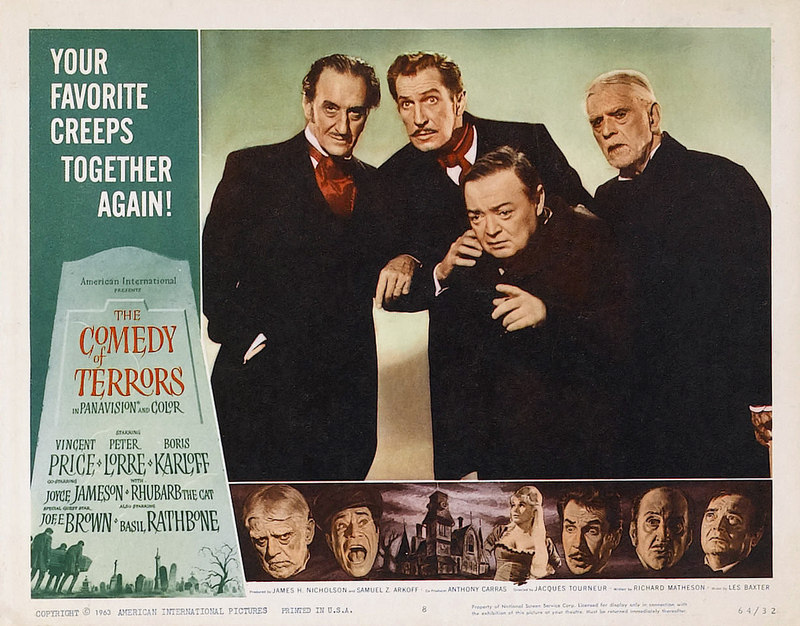 Rathbone, Price, Lorre, Karloff? 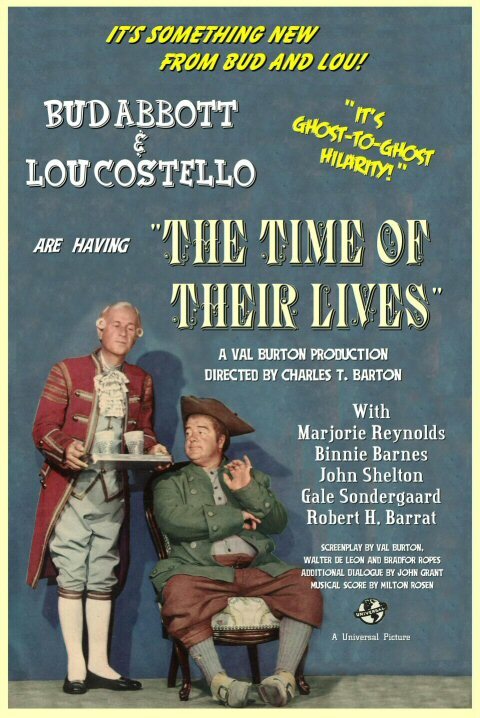 They have such fun playing off their dastardly film personas in this 1963 movie that your sides will ache. Richard Matheson wrote the story of a failed undertaker played by Vincent Price. Who fails at an undertaking business? It would be like not running a successful casino. Anyway, his ideas to keep the business going are murder! Jacques Tourneur (Curse of the Demon) directed and the aforementioned hams are delicious. Previous post found here. 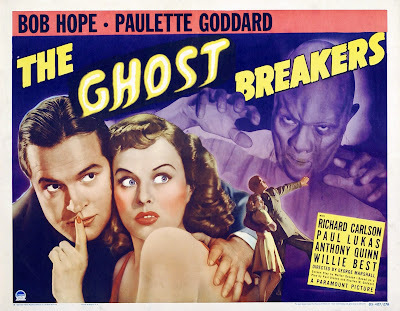 Bob and Paulette had a great success in the 1939 version of The Cat and the Canary, so naturally they were reunited in another comedy/horror flick in 1940. The Ghost Breakers screenplay by Walter DeLeon, like the earlier film he wrote, was adapted from a play. The director of our movie is George Marshall, who had a way with this sort of thing. See Murder, He Said, The Gazebo and the remake with Dean and Jerry of this one, Scared Stiff. Bob is a radio star who, with his servant played by Willie Best, is on the run from mobsters. He crosses paths with Paulette, who has inherited a fortune which comes along with a haunted castle on an island near Cuba. Can zombies be far behind? 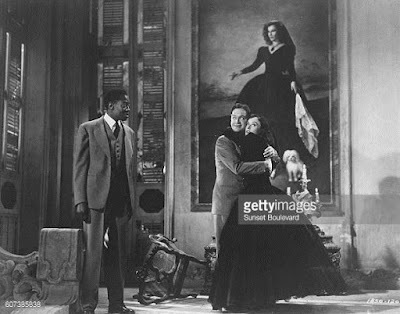 Also in on the fun are Paul Lukas, Richard Carlson and Anthony Quinn. Trust me. I enjoy it even more than their earlier hit, and I get a kick out of that one. A good, old-fashioned ghost story is just the ticket. 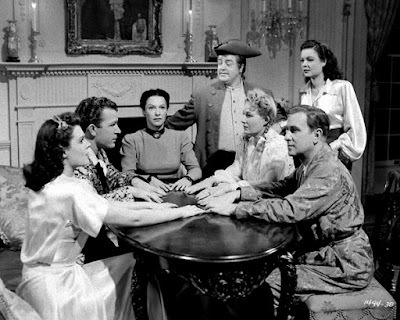 Lou and Marjorie Reynolds are ghostly holdovers from the Revolutionary War who need to have their loyalty to the cause proven or else they're stuck. Bud is the descendant of the guy who done them dirty. A Connecticut landmark is the setting for the clash of this world and the next. If you know nothing else about the movie, know that Gale Sondergaard is on board as a psychic. A great script by our pal Walter DeLeon (see The Ghost Breakers), and fast and furious gags abound. You'll love this 1946 film! We all have them; the movie that cracks you up, time and time again. 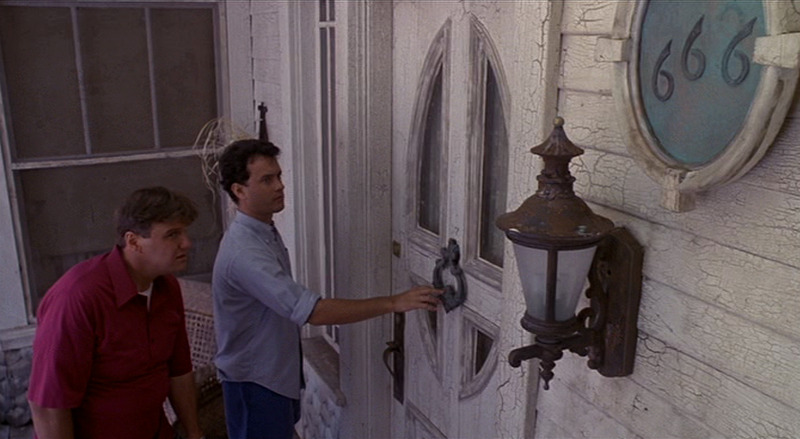 For me Joe Dante's 1989 comedy/chiller The 'Burbs is such a movie. The neighbourhood here doesn't really have anyone living in it that you would call "normal", but when one family is even odder than the rest, there may be something to worry about. Worrying is one thing, but actually organizing to do something about it is entirely different. Who knows where it will lead? Better to just stay in bed and read the paper. What do you think? Well, once you start down the Buttinski Road, there is no turning back! Again, trust me on this, there are lots of laughs and an especially fun bit with Gale Gordon. Well, there you have it, five of my favourite Hallowe'en movie chuckles. What does your list look like? I can always do with some more laughs. Good call on THE BURBS. Probably Hanks' weirdest film. Can't go wrong with a Joe Dante flick on Halloween night. Janet hasn't seen it yet. I'm hoping the promise of take-out pizza will get her on the couch. Hey, it worked for Blacula! She's very indulgent with her crackpot mom. I'll offer three excellent haunted house shorts from the silent era, followed by two talkie features. Color strictly verboten! Buster Keaton in his prime - what more needs to be said? A somewhat unexpected collaboration between maverick director Abel Gance (Napoleon) and pioneering film comedian Max Linder, bizarre, goofy, eerie, oddball. Possibly the very wildest and most inventive short by Charley Bowers, a one of a kind comedian who combined Keaton-like gags and mimickry with animation. 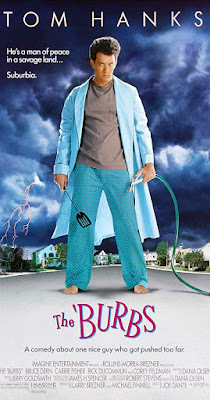 Shameless slapstick and "hick" humor combined with magnificent special effects and all around sense of fun. An added bonus for me is seeing Fred MacMurray wrestling with two of his co-stars from the previous year's Double Indemnity, playing very different characters. "Pardon me boy, is this the Transylvania Station?" "Ja, ja, track 29!" Uncle W, you are positively uncanny. Do you know what I saw yesterday afternoon for the very first time? You'll never guess. It was Au Secours! The absurd Linders/Gance picture was the opener for Silent Revue's season opener of The Unknown. Quite a day. I love Young Frankenstein because it is so inventive and funny. I hate Young Frankenstein because it has ruined O.P. Heggie's gentle old hermit for me forever! 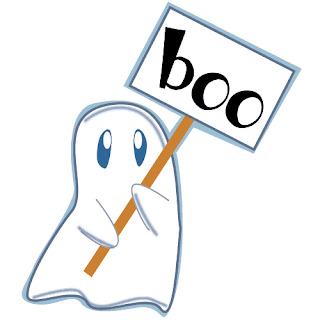 Shame on me for forgetting The Haunted House. There It Is goes on the gotta-see-it list. 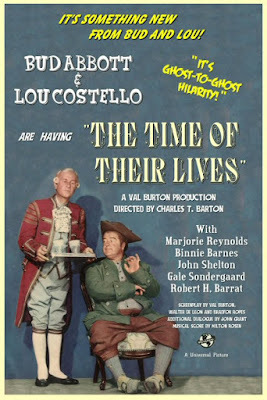 Of course, you can't go wrong with Abbott and Costello Meet Frankenstein - I'm surprised this film hasn't been cited yet! Also, Scared Stiff is a very nice on for Halloween. Bud and Lou Meet Frankenstein, but of course! How foolish of me not to include it on this list. I love poor Larry Talbot in this so much.